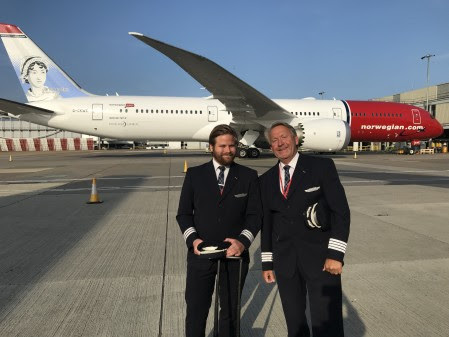 Norwegian mark’s Father’s Day by operating a Boeing 787 Dreamliner flight from London to New York by a Captain and his co-pilot son. The flight is the first time the airline has had a father and son fly the 787 Dreamliner together from London Gatwick. Images available to download here. Europe’s third-largest low-cost airline has more than 700 pilots based at London Gatwick to operate Norwegian’s affordable long-haul flights to the USA, Buenos Aires and Singapore. Norwegian has more than 28 Boeing 787 Dreamliners in its fleet, to serve all long-haul routes. British passengers can fly in the airline’s newest Dreamliners which are less than six months old and feature a larger 56-seat Premium cabin that offers passengers more than a metre of legroom. Captain Sven-Bertil Johannson (61) and his son, First Officer Erik Johannson (27) piloted Norwegian’s popular London Gatwick to New York JFK service, carrying more than 320 passengers on 6 June. Sven-Bertil and Erik were on the same pilot training course when they both joined Norwegian together two years ago. Sven-Bertil got his passion for flying by learning about aerodynamics while reading flying publications to help him race sailboats. Sven was a member of Sweden’s sailing team at the 1976 Montreal Olympic Games and shortly after began his flying career as a fighter pilot in the Swedish Air Force in 1978. He has now amassed nearly 23,000 flight hours. First Officer Erik Johannson was born in 1991 and was inspired to fly by his dad while sitting on the jump seat at a young age which fueled his passion for flying even further. Erik began flying at the young age of 15 and did professional flight training in Sweden. He joined Norwegian almost two years ago and currently has around 3000 hours. Captain Sven-Bertil Johansson at Norwegian said: “It’s an absolute joy to fly the 787 Dreamliner with my son to one of our favourite destinations. First Officer Erik Johansson at Norwegian said: “My dad inspired me to start flying from as far back as I can remember. Sven lives in Portugal with his wife, who also had a career in aviation, while his younger son and Erik’s little brother, is currently training to be a pilot. When away from the controls of a 787 Dreamliner, Sven and Erik enjoy sailing and skiing together in their spare time.